Tickets for the 2020 tournament go on sale at Ticketmaster at 10:00 am CDT, Wednesday, 3/20. Many people (including me) will be flying at that time to Pittsburgh. How is someone supposed to get tickets for the next year when they are flying to THIS year's tournament? How about tickets go on sale Tuesday - makes sense? Be glad they go on sale on Wednesday. They used to go on sale at 10a in the time zone of the next year’s site on Thursday. I can remember buying one year in a taxi after taking a Wed night red eye. Another year, I bought tickets on my blackberry while standing in line to buy a program prior to session I.
Isn’t the 2020 tournament in a huge stadium? Football stadium as I understand it. I heard a partially open roof though. Is that correct? Enclosed. 66k capacity. I’m sure it will be formatted so the seating is closer to 20k. It will be interesting to see it done in a football stadium, hope it will deliver. Partially open roof in March in Minny? C'mon now. Thanks Crew wrestling. Just saw your response. Wednesday may be better than Thursday, but it still is not fan friendly! It plays right into the bots purchasing all the available tickets. The bots are gonna get their share no matter when they go on sale. I buy tiks online from Ticketbastard probably 20 times a year, for at least the last five years. What would be a 'fan friendly' day and time? If there is one...I haven't found it. It sort of is actually. Open to the sky but not the elements. I didn't know the name of the place. Does The Stadium Have A Retractable Roof, Fixed Roof Or Is It Open-Air? U.S. Bank Stadium has a fixed roof; however, 60% of the roof material is made of transparent ETFE structure, allowing stadium-goers to view the sun and sky throughout the year while staying in a climate-controlled environment. Guests may want to bring sunglasses for daytime events. "Partially open" in Minny in March for The NCAA Wrestling Tourney just struck me as funny? No harm meant. Actually, right now they are fitting large "curtains" to cover up the glass for the NCAA Final Four this year that will be installed in a few weeks. Now that they have these, they may use them for the wrestling in 2020 as well if they think they need to. How about Tuesday or Monday when people are not traveling. None taken, it seemed strange to me also which is why I asked. I agree with you kgschalhoub, 100%. Completely asinine! Do it a week before, or better yet a week after so people are not confused with the current year's tourney. But having the on-sale day be the travel day is (and previously during Session I of the current year tourney was) just flat out dumb. Syracuse has done a basketball configuration for years in the Carrier Done. Drop a curtain on the 50-yard line, and have vendors on the opposite side of the curtain. I think they can seat up to 30,000 for a b-ball game. I'm sure they'll do something similar next year in Minneapolis. FOLLOW-UP: The can go as high as 35,000 for b-ball. The Dome has seen many of NCAA basketball's largest crowds. On February 1, 2014, the attendance record for an NCAA men's basketball on-campus game was broken by a few hundred spectators in the Duke vs. Syracuse ACC matchup. Attendance was announced as 35,446, as Syracuse went on to win 91-89, in dramatic fashion in overtime. This win marked the 21st straight win of the season for the Orange, breaking a school record for the longest unbeaten streak to start a season. The previous attendance record was set February 23, 2013 (35,012), the final game vs. long-standing Big East Conference rivals Georgetown Hoyas, as a member of the Big East. The Orange were defeated 57-46, ending the Orange's home win-streak at 38 games. Prior to the Georgetown Hoyas attendance record, Syracuse University held the previous attendance record also. On February 27, 2010, an announced attendance of 34,616 came to see the Orange beat the Villanova Wildcats 95-77. University officials briefly considered moving the basketball court to the middle of the football field for the 2014 regular season game with Duke- a move that could have pushed the attendance over 50,000. It was decided, to appease season ticket holders, that the court would stay in its usual location. However, the university did reconfigure the Dome to hold a new record capacity of 35,446. Does anyone know if they will actually be selling tickets for the full capacity of the stadium (66,000)? Or will it be somewhat confined? Any chance we can get the funzone set up as a big open mat so drunk fans can reconcile their differences in a civilized and honorable manner? There is a presale scheduled for 9 AM on Monday (3/18) on ticketmaster. Does anyone know the password or how to sign up for it? You got your wish. Pre-sale just went active. Seats for sale on both ends of the arena hopefully fans pick the right end to buy seats in. If you go through Ticketmaster, seats are on the ends and upper levels. 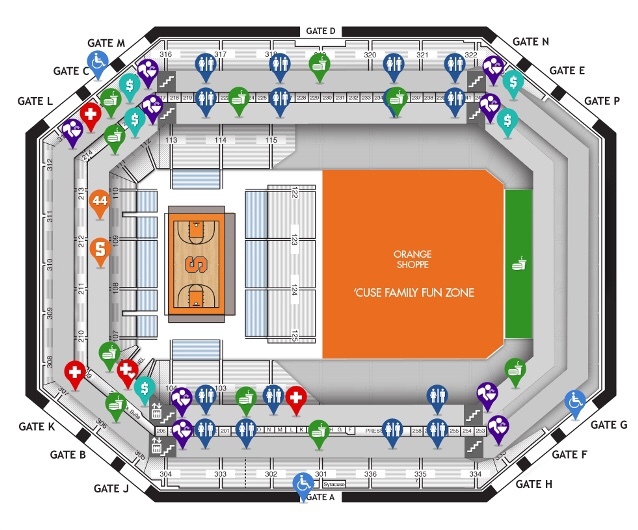 If you buy through PrimeSport w the Fan Experience, all seats are lower-level, center sections.